the voltage for which they are manufactured. For a 3-phase service, either 3-single-core cables or three-core cable can be used depending upon the operating voltage and load demand. Fig. 11.2 shows the constructional details of a single-core low tension cable. The cable has ordinary construction because the stresses developed in the cable for low voltages (upto 6600 V) are generally small. 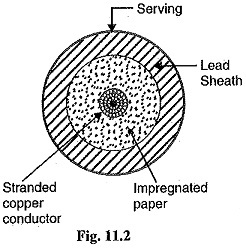 It consists of one circular core of tinned stranded copper (or aluminium) insulated by layers of impregnated paper. The insulation is surrounded by a lead sheath which prevents the entry of mois­ture into the inner parts. In order to protect the lead sheath from corrosion, an overall serving of compounded fibrous material (jute etc.) is provided. Single-core cables are not usually armoured in order to avoid excessive sheath losses. The principal advantages of single-core cables are simple construction and availability of larger copper section.